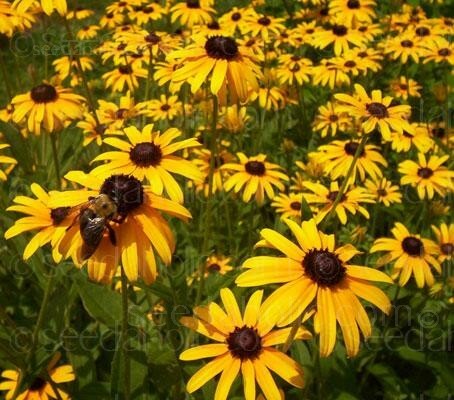 Rudbeckia "My Joy" has golden yellow flowerheads that are up to three inches in diameter. They are produced from midsummer until mid autumn and make an excellent cut flower. Given even a modicum of sunshine, flower follows flower until the entire plant glows. This North American native is gaining popularity outside of its natural habitat. Rudbeckia hirta occurs naturally in prairies, dry fields, and open woods. Its golden daisy-like flowers and long blooming period has made it a favorite of gardeners throughout the world. Rudbeckia "My Joy" has golden yellow flowerheads that are up to three inches in diameter. They are produced from midsummer until mid autumn and make an excellent cut flower. Given even a modicum of sunshine, flower follows flower until the entire plant glows. At the height of its glory it is so overpowering that its leaves are almost unnoticed. "My Joy" can be sown direct in spring and can be grouped together in a massed planting, which will highlight the size and intensity of their flowers. Growing them in meadows or 'en masse' provides plenty of flowers for cutting. They offer winter interest if left on until spring and birds appreciate the seeds too. Rudbeckias are often used as one of the main plantings in a 'hot' flower bed, which contains plants in the orange, red and yellow colour spectrum. Here they can be teamed with the tall yellow flower spires of Lysimachia and Yarrow, the rich red flowers of Monarda or Salvia and the reddish-orange flowerheads of Helenium. Sowing Direct: Sow directly where they are to flower into a prepared seed bed no sooner than two weeks before the last frost date. The ideal temperature is 13-16°C (55-60°F) Do not cover the seeds as they need light to germinate. Water well and keep moist until germination. Germination 7 to 14 days. Cultivation: The trick with Rudbeckia is to make sure it goes in soil which does not bake dry or the whole plant will collapse. A semi-shady position will help if the soil does tend to dry out in summer, as will a thick mulch, applied after a night of heavy rain. It will tolerate drought but grows best when watered. Fertilize rarely. Trim spent blooms to promote further flowering; however, some gardeners like to allow dried seed heads to ripen and remain through winter for cold-season interest. Birds will appreciate the seeds. Although they are essentially annuals, a few plants will persist from year to year. Plant Uses: Cottage/Informal Garden, Flower Arranging, Flowers Borders and Beds, Wildflower Gardens or Wildlife Gardens. Companions: Grasses, sunflowers, asters, chrysanthemum, crocosmia, salvia, dahlia, eryngium. Nomenclature: There are twenty-five species in the genus Rudbeckia, all native to North America. The genus was named by Linnaeus to honour his teacher, Olaf Rudbec a Swedish botanist and Professor of Botany at Upsal. It is pronounced rud-BEK-ee-a The genus is part of the Asteraceae, or aster family, which includes such other daisy-flowered genera as Dahlia, Chrysanthemum, and Aster. Make sure Rudbeckia is planted in soil which does not bake dry. Sow direct, two weeks before the last frost date.